Stock markets in the US are on a tear, hitting record highs lately. The job and the housing markets are likewise on a roll. 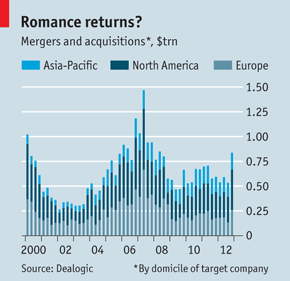 The merger and acquisition activity has also started to pick up (see chart at left). 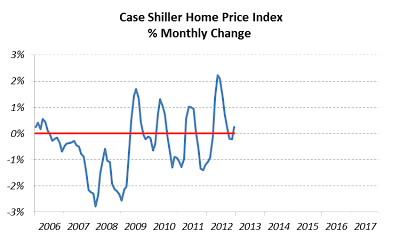 Has the economy really recovered from the Great Recession or is it just meandering along a predictable path that is characteristic of the Fourth Kondratieff wave depression? During the 1930s Great Depression, there were 7 rallies from the 1929 peak to the bottom stretching over a period of 3 years. Each rally produced a peak that was lower than the preceding one. But this time, it's different. The new peak is higher than the old peak. However if you dig deep into the causes, you'll realise that the playbook is the same. Misleading metrics have been put up to give an impression of an economic recovery. Given the right metrics, it'll soon be obvious that the pattern hasn't changed, only that the movement has been exaggerated because of Obama's deficits and Bernanke's QE that have topped trillions of dollars. The future is portending worse conditions. On the surface, however, things have brightened up: stocks, home prices and payroll number are all up. The bullish talking heads are back to rationalising why markets are going to breach new highs. A co-author of Dow 36,000 has come out of hiding to unabashedly declare that his prediction would be borne out in due course. Remember that the book was published in 1999, before the dotcom bubble. It's no coincidence that stock market crashes tend to follow preposterous claims of suchlike. Our three trusted charts — the total credit, the home price index and the labour force participation rate — can adequately explain the goings-on in the economy. 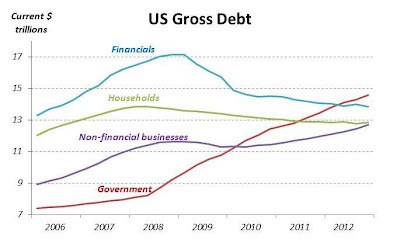 Our first series of charts pertain to the total credit or debt of the US economy. 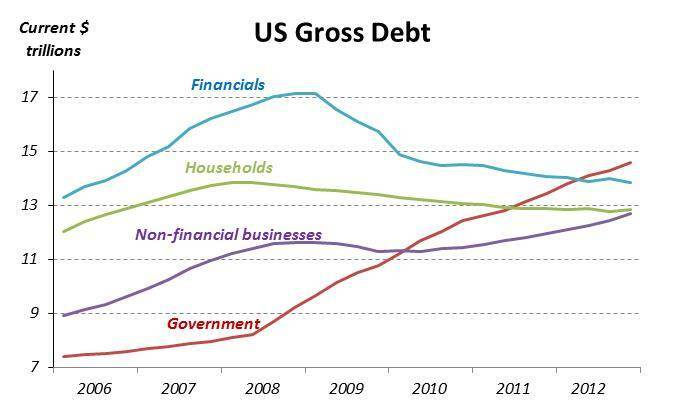 We begin with the absolute amount of the components of the total debt. Here we can see that the main driver of credit and, by extension, the economic growth of the US economy is government spending. This has been followed lately by businesses though this is the result of them being the ultimate beneficiary of the government largesse. Don't rely on the GDP component growth chart which always ascribes GDP growth to personal consumption. Personal consumption is the last in the spending chain. Consumers spend if they have stable incomes from government and businesses. The drivers of that spending have to be government or businesses. Although some of Obama's spending has gone towards social programmes, the money eventually flows to businesses. As a result, they're sitting on a cash mountain while raising junk bonds that bypass the banking system. No wonder the banks are continuing their shrivelling act. Although Obama's deficits combined with business borrowings appear large, in relative terms it's not significant which explains for the sluggish growth of the US economy. Moreover compared to the past quarters, its motive force has been on a decline. The 3.1% YoY growth in credit in the last quarter 2012 yielded only a 1.6% YoY growth in GDP. 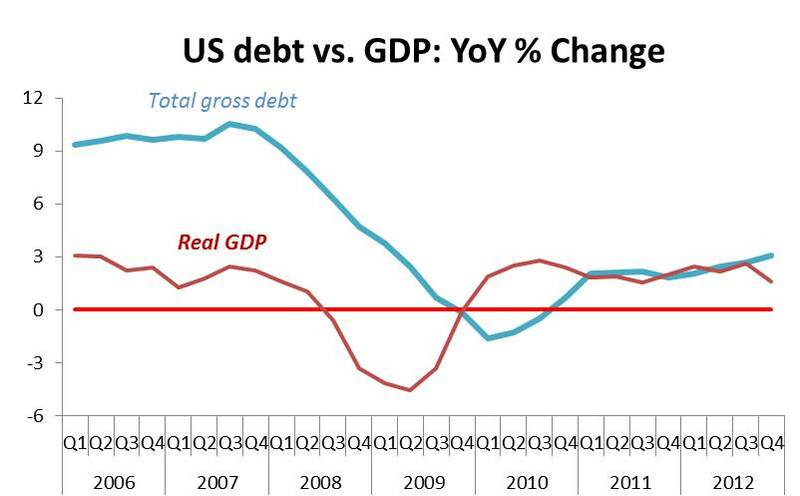 That must have been the lowest GDP growth to credit growth ratio since the Great Recession. This is evident from the above chart by the contradicting movements of the two lines. It signals that the credit utilised is not being spent in the economy but being used for speculation in commodities and stocks, including equity buyback. This is the negative fallout of Bernanke's QE: by suppressing interest rates, it has encouraged risky speculative investments in other assets. Because QE won't lead to greater spending, it's not money in the real sense but illusory money that will disappear once the investments' value starts falling. Meanwhile Bernanke is gratified with the rising stocks, not realising how much wealth will be destroyed once reality sinks in. On the other hand, unknown to many, the unexpected higher rate of credit increase contributed not in a small way towards Obama's reelection win in November 2012. But aren't the rising stock prices justified by the improving profits of the US corporations? Remember our monopoly board game. The sole winner will continue winning as long as others, which in the real world means the US government, continues spending. But the stock indices capture only the performance of the small number of winners, not the majority who are on the losing side. 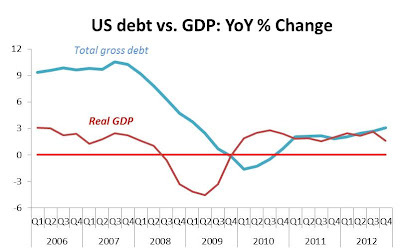 With the sequestration in effect, future credit growth will be stymied and so will GDP growth and corporate profits. 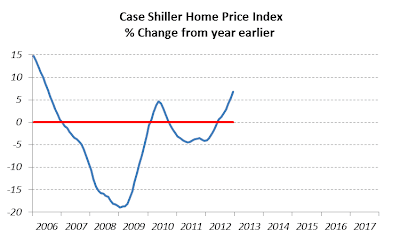 Next are the series of home price index charts. 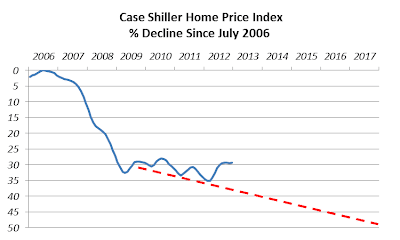 Newspapers and other publications have been publicising the continued rise of the US home prices as observed on the left chart. Bernanke must also be relishing at the sight of this. But this chart is deceptive. If you ask any asset manager on his investment performance, he'd choose a convenient reference point that will portray his performance in a good light. We can similarly present the same using a different reference point, not one but two. 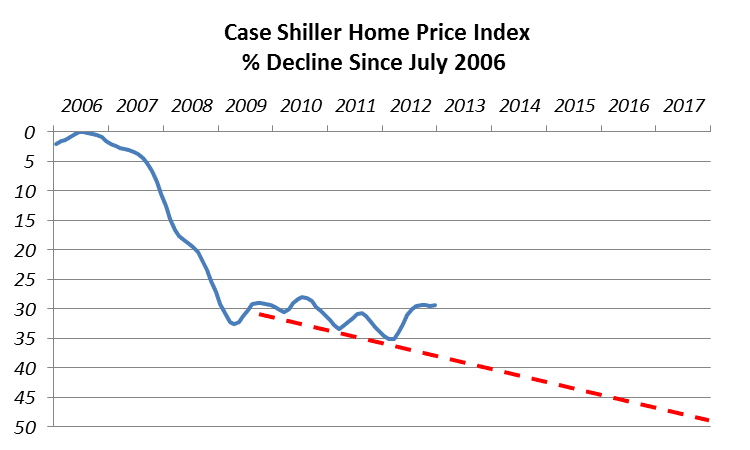 First is the home price index since the start of the decline in July 2006. A different picture now emerges. The index is struggling to rise. It should have been falling but the recent uptick in credit has been artificially propping it up. The next few months will provide a clear direction on its true movement. The second reliable home index chart tracks its monthly change. Here you can see the index moving up. But this movement is still indecisive. It's only a slight uptick which can be confirmed if it continues over the next 3 months. Bear in mind that in each of the last 4 years, Obama had a trillion dollar deficit firepower. This year it is being neutralised. 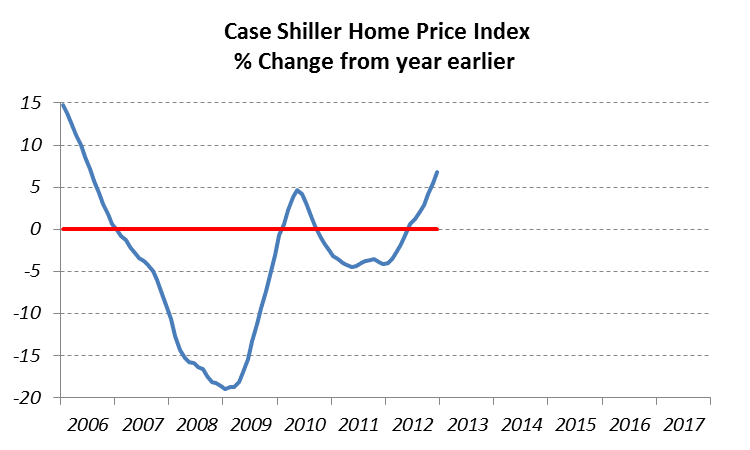 Can home prices continue their upward move without the help of federal deficit? Our final true indicator, the labour force participation rate, needs no chart. You can view it at the Bureau of Labor Statistics website. The US unemployment rate has just registered a record four-year low at 7.7%. That's nothing compared to the LFPR which is at a record 31-year low at 63.5%. Actually, the number was reached in August 2012. It improved slightly over the last few months but now has fallen back. Again the next few months will confirm the direction in which the employment market is heading to. So with metrics, be very wary of what is being presented. In the business world, everyone is well versed at gaming the numbers. So it is in economics. If you're investing, generate your own metrics as things portrayed by the media are not what they seem.